Hello, my name is Eva Georgieva, presently a pro card winner and competitor in WBFF but let me start from the beginning of all this. The pictures you see are the result of my 15-month-work with Kiril Tanev – my coach. In this physical shape and with this looks I won my WBFF LONDON pro card. My way to achieving this goal started with my participation in the reality show of “Bodyconstructor”, “Super Change 2”. Just like this, as a joke and after they challenged me. But this was a challenge which I wanted to accept and which woke my biggest desire to improve my appearance. I simply wanted clean, well-trained and perfectly shaped legs! This was a challenge, which I was firmly determined to accept in order to understand if I would achieve the results, I wanted. Now is the time to mention that my inner sense told me I would succeed, I would find the right way, the right diet and eventually I would achieve what I wanted. You know, everyone who seeks, finds! Thus, firmly convinced of my success and highly motivated I signed up for the casting of “Super Change 2”. I had absolutely no idea of what I was taking up with, what was going to happen and what it would cost me but this didn’t matter as in the very beginning I was not interested in winning “Super Change 2”. I was firmly convinced that I would do everything to the smallest detail in order to have the legs I was dreaming of:)! Then I met Kiril Tanev for the first time, I was pleasantly surprised of his decision to include me in his team. This period coincided with big changes in other aspects of my life – moving to a new apartment, repair works, summer vacation and enormous changes in my personal life. Moreover, I was professionally overloaded and all this came on my like an avalanche. Thus, in the beginning of the summer, I found myself in an apartment, which had to be repaired and furnished; with three students, who were in school vacation, my work and workouts twice a day! On a diet which required precise shopping, daily cooking etc. You can imagine what burden I had to carry. For me, working and taking care of my family is something normal but I had to add additional hours for my workouts. And some more time for preparation of my food, so I stole from my sleep, which I had always done in my life because doing several things simultaneously is something normal for me. I never had any difficulties with the workouts. The food was some kind of a problem because in the beginning I had to eat but I wasn’t hungry; I was a hundred percent sure that I would do everything perfectly and I managed. Then came the moment when I got hungry at every hour but now I know what it is like:). The improvement of my physique motivated me to go on stage. A year ago, when Kiril saw my stage potential, he told me about WBFF. He drew the path; I only had to start walking on it and fulfill it. I asked him about every small detail and he was always there for me! Support and motivation – this was all I needed and he gave it to me wholeheartedly! It sounds easy, but this was my goal. A goal which had its price and I was ready to pay it. I constricted my social life to the minimum; only there I could steal some time because from my family and work I couldn’t. My first competitions were in category “Bikini Fitness” and I stood out with a more shredded and trained body. I was pleased with my shape. Moreover, it corresponded with my initial aim. For the first time on the Balkan Competition in Serbia, there was a category “Wellness”. I competed and won the silver medal. This was the first medal for Bulgaria in this category and my first medal! Immediately after my participation, I started preparing for the contest in WBFF, which at that moment was my dream. I did my second bulk period and afterwards time passed so quickly. I decided to compete in the Bulgarian Republic Bodybuilding Competition because for the first time they included “Wellness Category”. 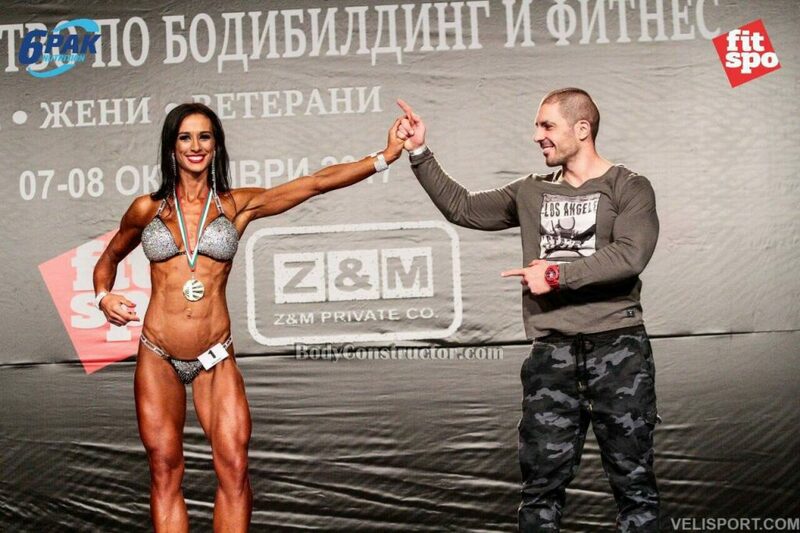 I won the gold medal and I was the first Bulgarian champion in this category. I didn’t realize how fast time flew and it was time to compete in London where my triumph was unconditional!